SISTER Streams New Single, "Unbeliever"
The Swedish sleaze/punk influenced metal outfit known as SISTER, who hail from Stockholm, Sweden, has been working hard during the last ten years earning the reputation of being one of the best live acts out there. 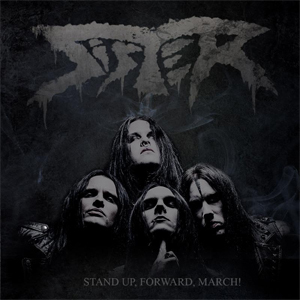 Now, SISTER is back with their new record, Stand Up, Forward, March!, due out November 25th via Metal Blade Records. The album was recorded in the city of rock n' roll - Upplands Vaasby, Sweden - by SISTER and producer Jona Tee of H.E.A.T., mixed by Tobias Lindell and mastered by Christian Schneider at Scandinavian Mastering. You can stream the new single, "Unbeliver", below and please visit metalblade.com/sister where Stand Up, Forward, March! can also be pre-ordered in various formats. SISTER comments: "The second single, "Unbeliever", was written by Cari Crow, Tim Tweak and producer Jona Tee. "Unbeliever" really is an 'in your face' kinda song which we felt that the album really needed. Raw vocals, killer melodies and a great drive all through the song!" After Stand Up, Forward, March! 's release, SISTER will head out on a European tour with NOISE POLLUTION as direct support. See below for all dates!